The Executive Board of the International Monetary Fund (IMF) approved today the first review of Ethiopia’s economic performance under the 14-month arrangement under the high-access component of the Exogenous Shocks Facility (ESF). The Executive Board decision was taken on a lapse of time basis1. The approval will enable Ethiopia to draw SDR 40.11 million (about US$58.7 million), bringing total disbursements under the arrangement to SDR 113.65 million (about US$166.2 million). Now that the Election Board has spoken out loud and the results will be official by June 21st should MEDREK and AEUP cut their loss and accept the people’s verdict and move on or try the last resort going to the courts to demand for re-election? Interview with Ato Wondimu Asamnew, Minister Counselor I and Public Relation and Diplomacy Head at the Ethiopian Embassy Washington DC. 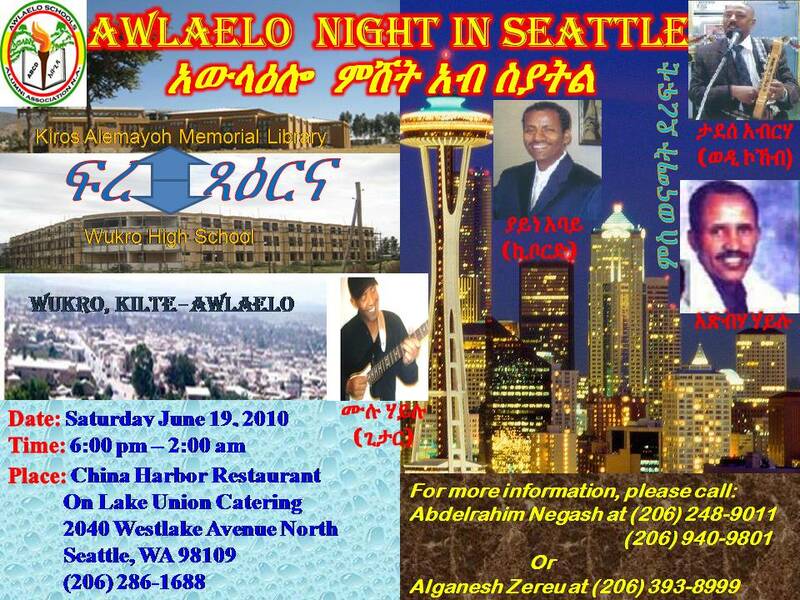 Ato Tsehaye Debalkew from Selam Radio asked the minister on issues related to election 2010. The minister went in detail on the genesis of election in Ethiopia and the current results and the deliberate attempt to confuse the public by some quarters in regard to the “99.6%” win. Eritrea: genuine overtures for peace or more of the same? Addis Ababa, June 8, 2010 (Addis Ababa) - Centers for Disease control and Prevention (CDC) provided 128 million USD support for strengthening health services in Ethiopia, Embassy of the United States of America to Ethiopia said. In a press statement sent to ENA on Tuesday, the embassy said CDC Director Dr. Thomas Frieden is here for a five-day visit. June 8 (Bloomberg) -- Ethiopia, whose army pulled out of neighboring Somalia last year, showed the greatest rise in peacefulness in 2009 among 149 countries studied in a survey released today. Bratwurst, beer mugs, waitresses in dirndls and folksy slogans on the wall. It sounds like a beer hall in Bavaria. But this bar is actually in Addis Ababa, where an Ethiopian brewer has built a culinary monument to his former home in Germany. Rivers are a gift of nature – but to whom? 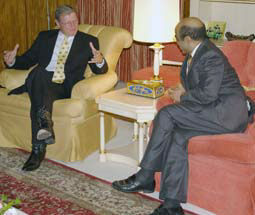 Senator Inhofe and PM Mmeles also discussed on regional issues including Sudan. PM Meles told the Senator the peace agreement of Sudan is significant to the region.PM Meles also said affairs of Sudan should be left to Sudaness themselves. Following the announcement of provisional results for the national and regional elections held a fortnight ago, various opposition parties have revealed their take on the result and the election process. They attributed their defeat to a host of reasons ranging from the harassment, intimidation, jailing and even killing of their members to expulsion of their election observers from polling stations to ballot box stuffing and the like. Ethiopia’s Missing Opposition: What Is To Be Done? 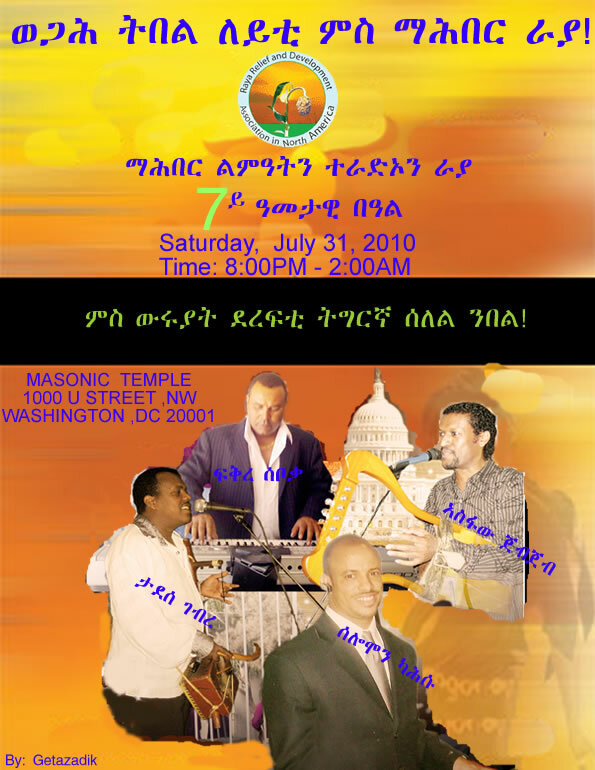 Concert with Daniel Band Saturday 26, June 21:00 PM to 6:00 AM. Opinions and Views published on this site are those of the authors only! Aigaforum does not necessarily endorse them. © 2002-2010 Aigaforum.com All rights reserved.